Brecknell C3235 is a watertight checkweighing scale for the rapid indication of over, under or acceptable weight in a washdown environment. This check weigher is available in three models from 6 lb (3 kg), 12 lb (6 kg) and 30 lb (15 kg) capacity with readabilities down to 0.001 lb (0.0005 kg). The Brecknell C3235 is a watertight checkweighing scale for the rapid indication of over, under or acceptable weight in a washdown environment. This checkweigher series is available in three models from 6 lb (3 kg), 12 lb (6 kg) and 30 lb (15 kg) capacity with readabilities down to 0.001 lb (0.0005 kg). 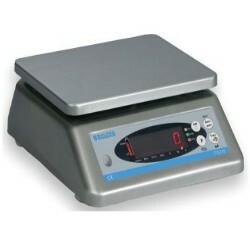 This compact and portable scale is specially designed for use in wet environments. The C3235 is ideal for harsh environments such as food processing, meat and fish markets, chemical and outdoor use. Washable and corrosion free, this product is perfect for almost any culinary, food processing, portion control, packaging, and checkweighing applications. The front panel includes the display window, annunciators, over, accept, under traffic lights, four operator keys and the level bubble.